Hello everyone, welcome to Workman Scraps. Today's post will be short, on Monday I had surgery on my hand (luckily not my dominant hand). But I wanted to share this with you. Using the new Cricut Cartridge Tags, Bags, Boxes, & More 2, cut two boxes at 9" from page 40. Little Easter treat boxes, yellow for my daughter and the green for my son. The stamp images are from My Creative Time Hello Spring and Happy Haunting. other supplies I used: memento tuxedo black, memento bamboo leaves, copics to color the little bunnies and American Crafts ZING! embossing powder frost and lavender, twine from Pink By Design and ribbon from stash. The paper used for the boxes is DCWV Luxury stack. Hi Everyone! Welcome to Workman Scraps. 1. I have no clue how to work or tweak an uploaded video. 2. I hope I learn my way around YouTube quickly. All the paper, stamped image (colored with copics) and sentiment is from Peachy Keen Stamps pick kit and PKSC-02 February kit. I also used buttons from own stash, Martha Stewart flocking powder and My Creative Time - stitched oval die. I forgot to take a picture of the inside, it says...On St. Patty's Day. Hope you enjoy today's post. If you have any tips and/or tricks for videos and YouTube please feel free to email me. With this card sketch from Twisted Sketches, i made this card for all the Leap Year baby's: from me to who ever is celebrating their birthday on Leap Year...Happy Birthday! This week's twist is 'LEAP'. For this birthday card, the paper used is from Pink Paislee Daily Junque, stamp sentiment is My Creative Time - WOW! So Many Candles, buttons from my own stash and a cute poem I found online. I'm a little Leapling, smart and fun. When I turn four, I'll really be one. I'm a little Leapy, with lots to do. When I turn eight, I'll really be two. I'm a little Leaper, with lots to see. When I turn twelve, I'll really be three. I'm a Leap Day Baby, and so much more. Wen I turn sixteen, I'll really be four. I hope you are able to join us at Twisted Sketches - Cards. My daughter loves keeping treasures. Just little things that mean a lot to her from various occasions or places we have seen. The box she did have was an old shoe box she had from several years ago. I tried to repair that one but it was a hopeless case. My Dad was going through his things and found a few old cigar boxes that he obtained several years ago, he had planned to use as storage. Lucky ME! Most all the products used for this altered project came from the Scraps of Darkness Envy kit. It took me longer than expected to complete this box but the look on her face when she received it has worth it all. So know she has a 'real' treasure box for her treasures. Happy Ash Wednesday my friends and family who celebrate! I have been busy working on a few projects for design teams, for fun and also, I am taking a short online class with Melody Ross (I hope to have it complete this weekend). First, congratulations to the first challenge winner...Julie T.
Second, Welcome to another sketch challenge at Graphicat Sketches. Now on to the sketch and challenge. 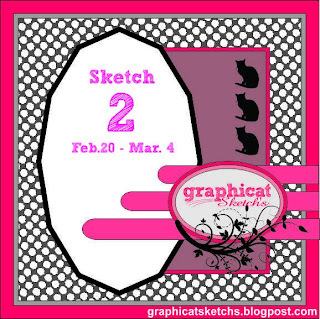 Starting today until March 4, submit your take on the sketch below at Graphicat Sketches for a chance to win the Margarita Stamp set from Graphicat Designs. Supplies used for my take on the above sketch: Authentique 6x6 Blissful pattern paper, cardstock Summer Sunrise from Papertrey Ink, Cricut Cartridge Art Philosophy; Bo Bunny Et Cetera Chipboard, image and embossed stamp from My Creative Time, and sentiment from Graphicat Designs. Thank you all for hopping along with Graphicat Sketches. Until next time - happy scrappin'! ~ Carol. Well read on my friends, your questions will be answered. All last year I heard, read and saw about 12 Tags of Christmas, and because of my course schedule, I did not have the time to create any. So I resolved to do them all in 2012. "so i've decided to officially retire the "12 tags of christmas" as we know it, and begin the 12 tags of the year. of course with this year being 2012, what better time to kick off this new concept with the "12 tags of 2012". so at the beginning of each month i will post a tag tutorial (with step by step photos, video, etc). this tag will be themed to that month's holiday season if applicable, or just a new idea to share. i will have the inlinkz live to allow you the entire month to upload your creation inspired by that month's tag. at the end of that month, we will select winners at random from those who have uploaded a project, and post them on the blog with some great prizes. of course there is also a blinkie on the side of the blog you can download and post on your own blog sharing your participation in the new "12 tags of 2012". i'm so excited for this new concept since it will inspire me with new ways to create each month, give you time to create as well, and share a wider variety of ideas. just think... the new 12 tags will be like christmas every month!!! (okay so i already know i'm behind this new brainstorm, butlet's just focus on this month's tag and i'll catch up with january's tag nextmonth - fair enough?)" What an awesome new adventure! I am really excited because I will final have the time to 'tag' along. 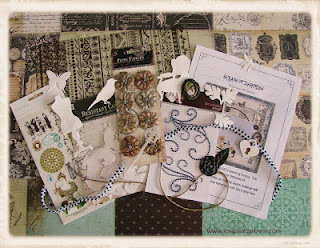 I cut a heart (1") and a cherub (2 1/2") on Tim Holtz grunge paper from Cricut Cartridge Victorian Roman. The cherub is inked with Barn Door distress ink and dabbed with ruby slippers glitter stickles. The heart punch is EK Success and Martha Stewart. The tag was stamped with snow cap paint and Stampers Anonymous - Purely Random and embossed using sizzix floral flourishs.Ribbon is from personal stash embellished with Tim Holtz ideology. 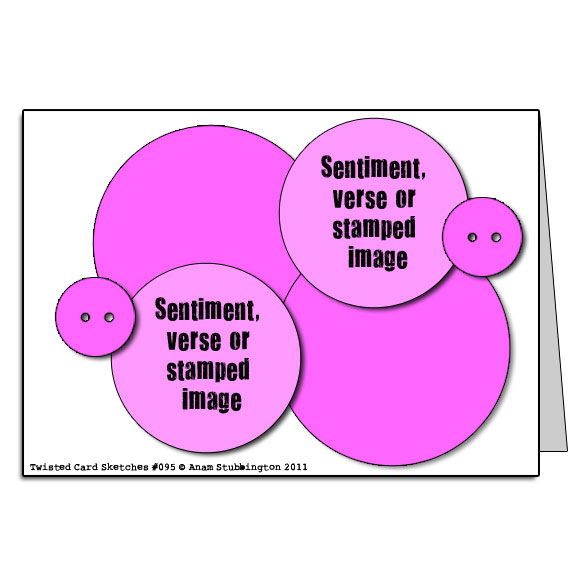 Last but not least the sentiment and tag set is My Creative Time - Teeny Tag Greetings. Simon Says Stamp Challenge - "Tag It"
Until next time - happy scrappin'! Today is reveal day over at Scraps Of Darkness. I love this kit club and recommend it for everyone. 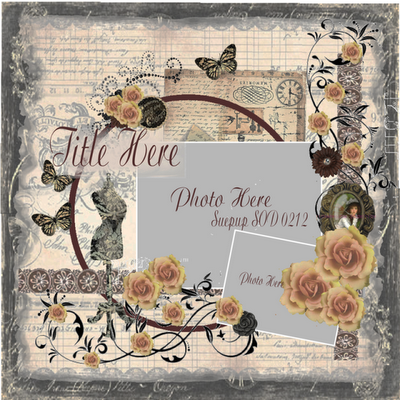 Also if you don't have a dark side or are just not into that kind of scrap booking...check out Scraps Of Elegance for the softer side. Not only can you get pattern paper, embellishments, flowers, handmade pin and a sketch but the kit add-ons of cardstock, flora & fauna, color, and romance are perfectly coordinated for each kit. I loved Suepup's sketch this month for the Victorian Kit for February so much so that I didn't change much. For more inspiration, click HERE to see what the design team has created. I made this card with several challenges in mind and also a great excuse to use some recently purchased copic sketch markers from iCopic. I have been wanting to learn how to use them, I figured just do it and see what happens. At iCopic Weekly Challenge #69, use blue green on something. So these are the copics I used to help create this card. I made this 6x6 card with prima reflections collection, epiphany tool round 14, Sentiment - Jaded Blossom Sweet Celebration, My Creative Time stitched oval die. Jaded Blossoms Monthly Challenge - valentine theme using at least one Jaded Blossom stamp. Hope you enjoyed the card. I will leave you with a few photos of the kids school valentine's. Paper is the Paper Studio; face on 3 & 4 photo is Peachy Keen Stamp PKSC-01; ribbon from Hobby Lobby; the treat box, lollipop die, scalloped & stitched circle are all My Creative Time. Thank you for stopping by, again Happy Valentine's Day. Happy Monday all my blogger friends! Hope you had a wonderful weekend and were able to get a little crafting in. Today I am sharing a card I made for My Creative Time's Throwback Thursday Challenge. Supplies are: sentiment - My Creative Time This & That and Fancy Frame stamp & die; pattern paper - Echo Park Victorian Garden collection; cardstock from Papertrey Ink; Tim Holtz distress ink Antique Linen; Ranger Ink Coffee; Peachy Keen Stamps PK-490; Snail - Cricut Cartridge Paisley page 24; Hills - Cricut Cartridge Country Life page 72 and ribbon is from stash. I had fun making this one, I hope you like it. It's another inspirational card sketch from Twisted Sketches. For today's sketch the twist is "Heart" any how, any way. I used Cricut Cartridge Victorian Romance for the heart and Cricut Cartridge from Creative Memories 'Tis the Season. All paper is from AC Cardstock-Valentine. The bling is Websters Pages - Winter Fairy Tale Gems. 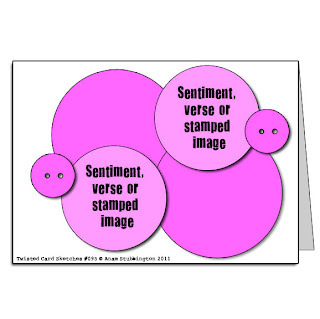 The sentiment is My Creative Time '100% Sweetness' stamp set. Hope you are inspired to play a long with us this week! So sorry I am just now getting the winner announcement posted! I have been busy crafting and neglecting my blog but come back tomorrow and all next week to see what I've been working on. hehe I love this card!! The image is soo cute and you've coloured him fabulously! Welcome to the team!! please email workmanscraps@gmail.com with your mailing address and I will get this out to you asap. Welcome to the Graphicat Designs first Blog Hop and Challenge of 2012. Today Graphicat Sketch Challenge is having a blog hop to announce a relaunch, new design team members (YEAH ME) and some new *Anti-Valentine* Digi releases. If you have stumbled upon this hop, please jump back to the BEGINNING and be sure to leave some love for everyone along the way. You will be inspired to create a few more cards with the fabulous sentiments and images at Graphic Designs. If you came from Jess Myscrapdiary, than you are in the right place. Here is the sketch for this challenge and you have 2 weeks to join in on the fun and of course, of course there will be a prize. The rules haven't changed, you can use any image you like, does not have to be Graphicat anything, but we sure do love it when you do. I am too excited about joining the talented ladies at Graphicat Designs. Cheri has some of the best sentiments and digi images that are simply fantastic. For today's sketch, I used copic sketch markers to color Simply Betty Stamp - 2011 Valentine Christian, pattern paper is from the Paper Studio - Love You, prima, My Creative Time - Tenny Tag die & Scalloped Die, distress ink - vintage photo & spun sugar & barn door, stickles, and the sentiment if from Graphic Designs. Up next is Tara Nixon - please stop by and leave some love. Thank you for joining us on this hop today and leaving a little love along the way. 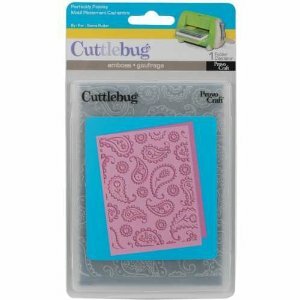 Also, to celebrate my first blog hop with Graphic Designs, I will randomly pick one winner on Thursday from all the comments left today to win the Perfect Paisley cuttlebug folder. Winner will be announced on Friday, February 10. I am one very proud Aunt! My niece played Wendy Jo in her high school musical play Footloose, last night was opening night and I have to say I was not expecting to love it like I did. I know my niece can sing but she always amazes me with hidden talent. Who new she could sing, dance and act all at the same time! WAY TO GO! The students, staff and crew spent hours, days and months preparing for the three days that they will perform for their high school play. And last night all their hard work, sweat and even tears paid off when they hit the stage for opening night of Footloose! Everyone did an amazing job and I was/am very impressed with the entire production. At end they closed with a sing-a-long to I Need A Hero dedicating and saluting our military and public servants. Below is the closing picture (we weren't "allowed" to take pictures-but what kind of scrapper am I if I don't sneak one-haha) of the sing-a-long. 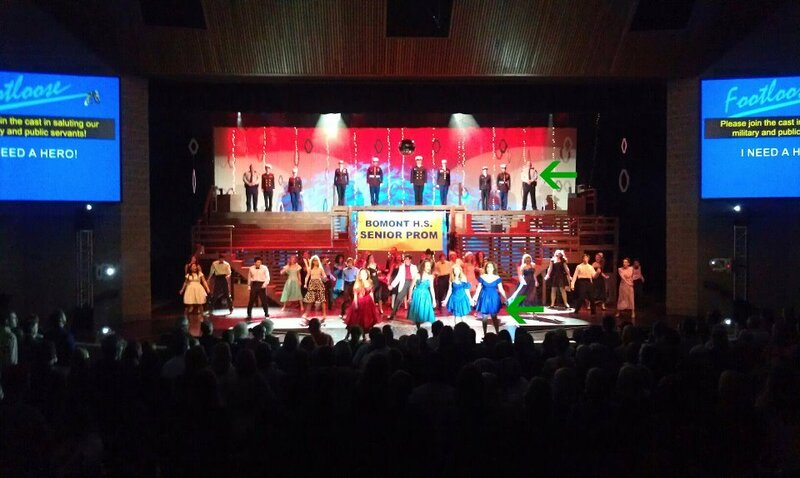 The two arrows are my niece (right-center stage) and my Daddy (police officer, top right). Footloose was just amazing! Fabulous job Terrah - you make us proud everyday because you are YOU! Next I have a card to share. I used Cricut Cartridge Hello Kitty, Pink By Designs - A Haunting We Will Go & zebra background stamp with Shimmer Enamelz - Sparkliscious for the background. Perfect card for Valentine's Day or even just to give.